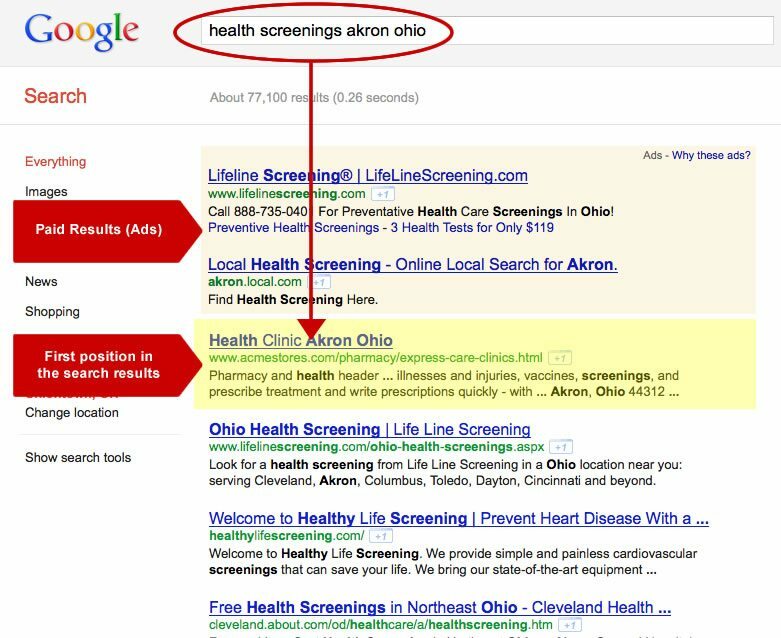 The power of one page that’s properly optimized for search is staggering. At Sanctuary Marketing Group we believe in the power of organic SEO and content marketing. Unlike traditional advertising methods and “pay-per-click” advertising, SEO and content marketing is an investment. An SEO optimization for each page on your site is essentially a one-time project and marketing cost that can will keep on returning value and new customers for years. SEO and content marketing really is the gift that keeps on giving. By taking a little time to properly research a subject and design and code the page we can begin to position your business in the organic search results where real customers are searching for what you do. Over time we will continually identify all the many ways that customers search for what you do and create more content, therefore creating potentially hundreds of “landing pages” that will show up for relevant searches on Google, Yahoo and Bing… for free. To demonstrate this point we’d like to show an example of how ONE PAGE of PROPERLY OPTIMIZED CONTENT can return measurable results. The example below is a page from one of our grocery store clients that offers healthcare clinic services within their stores. We created one page targeted toward their in-store health clinics. 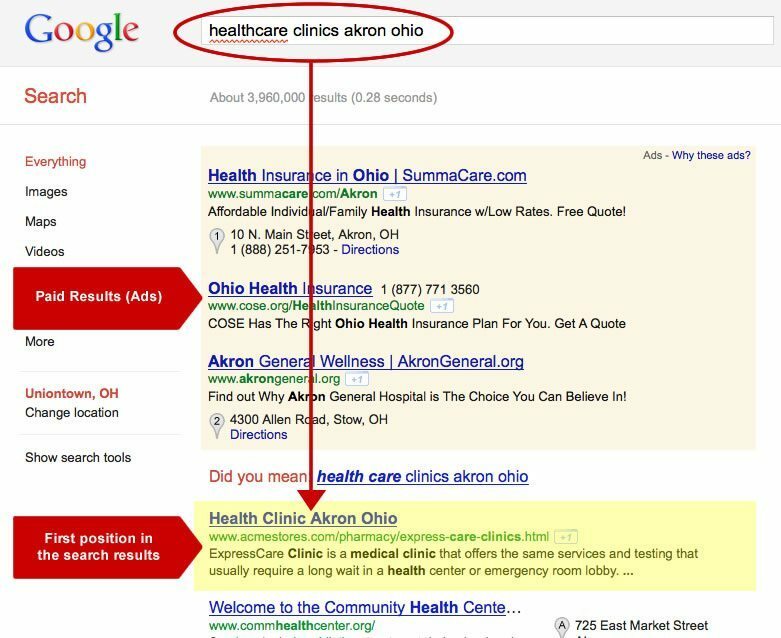 You can see from the examples below that they show up in the #1 and #2 positions for many priority phrases related to health clinics in Akron Ohio. 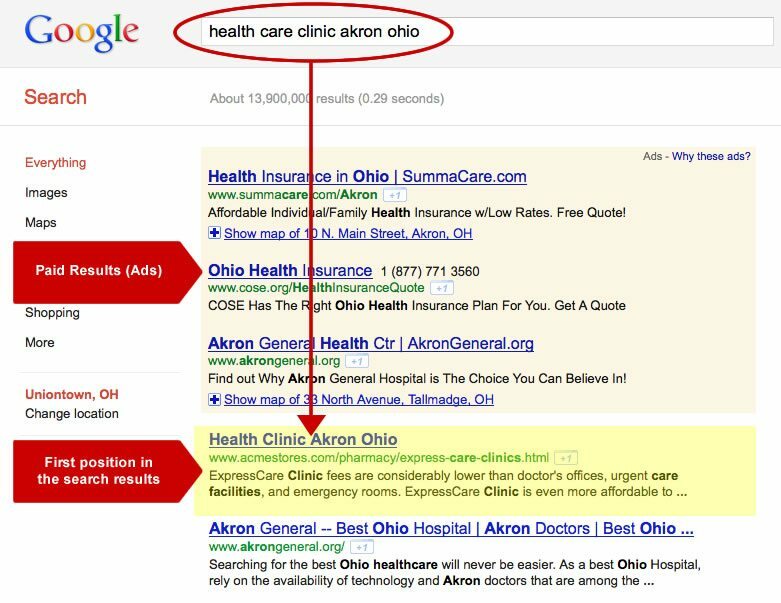 The same results can be had for any business through an investment in SEO. 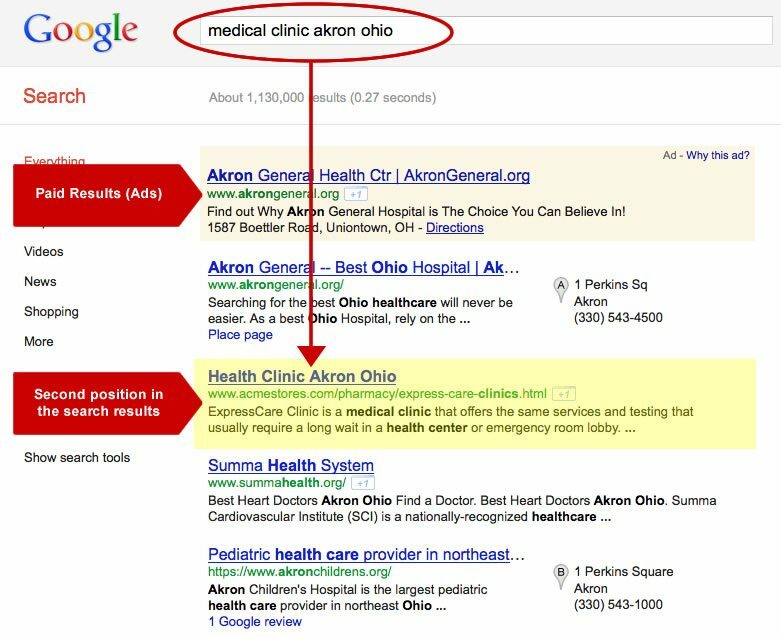 Please note: This page no longer ranks as high in the search results as it did when we initially developed this case study. The service has been downgraded at the stores and the page has been updated.